East Jakarta Social Sub-dept. builds three refugee tents for fire victims of RT 02 and 11, RW 01, Pondok Bambu Urban Village, Duren Sawit. There are 87 families with total 200 people are affected due to this fire incident.
" They are accommodated in refugee tents that we built on RPTRA yard"
East Jakarta Social Sub-dept. 's Social Empowerment and Protection Section Head, Abdul Salam explained, two tents are used for residents to rest and one tent is used for logistic aid. Besides, his side also provides public kitchen. "Based on procedures, refugee tents will be provided at least in three days. But if it is still needed, it can be extended. This is built to help fire victims," he conveyed, Thursday (8/23). Not only tents, his side also gives 30 mattress and 200 food boxes. 20 personnel from Tagana and Kampung Siaga Bencana (KSB) volunteer are also standby on the location to assist the refugees. 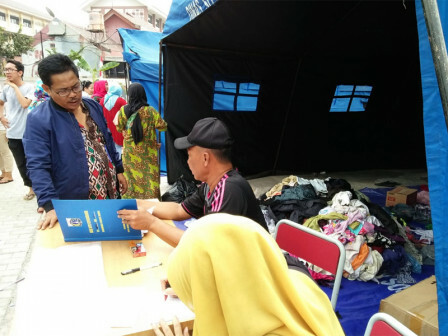 Pondok Bambu Urban Village Head, Angga Sastra Amidjaya mentioned, 87 families or around 200 people are affected by fire incident according to collected data in refugee tents. Currently his side is still trying to ask East Jakarta Environment Sub-dept. regarding mobile MCK (water sanitation and hygiene practices) for fire victims. "They are accommodated in refugee tents that we built on RPTRA yard," he added. Pondok Bambu Urban Village KSB also gives 24 blankets, four cartons full of toiletries, nine cartons of secondhand clothes, 30 cartons of mineral water, two cartons of sardines, three cartons of toddler foods.